Shiver me timbers.. Banana Fritters! What are these monkeys doing? What is this lady looking at? 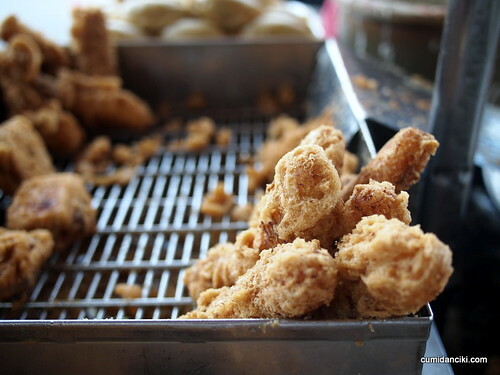 It’s Mr Chiam’s Goreng Pisang Stall (Banana Fritters) and we are hungry! 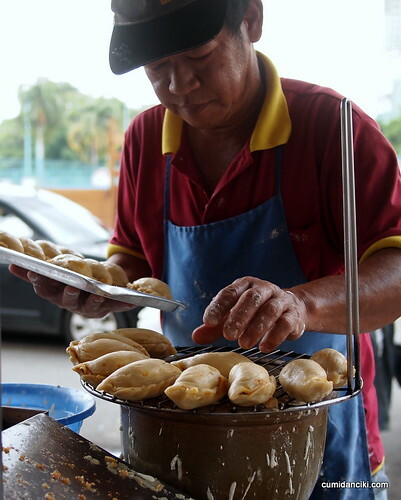 One of the best snacks to have at 4pm in the evening is the famous Kuih Bakul from Mr. Chiam’s Stall in Brickfields. 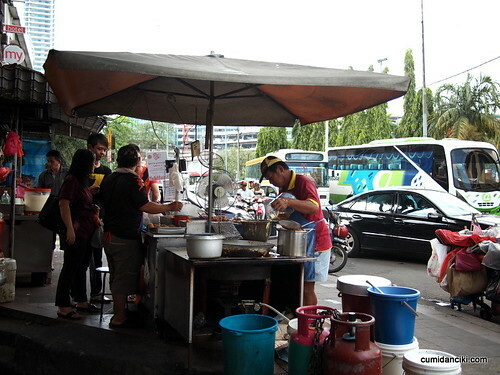 Of course this stall being a bit of an institution and all, was definitely on our list of places to bring @ladyironchef to visit, while he was in KL. We wanted him to try the Kuih Bakul. 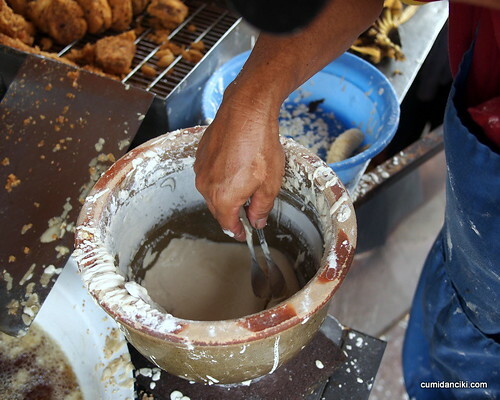 So what exactly is this Kuih Bakul you might ask? It is a square savory cake made from yam, sweet potato and the sticky, sweet, brown nin ko. Nin ko is the famous sticky rice pudding that every good Chinese person knows and it is a must during the Chinese New Year season. It is offered to the Kitchen God on Chinese New Year’s Eve, so that the sticky and sweet rice cake in his mouth will compel him to report to the God of Heaven, only good things about the household he visited! Anyway, here at Mr Chiam’s Stall, this is done superbly well. 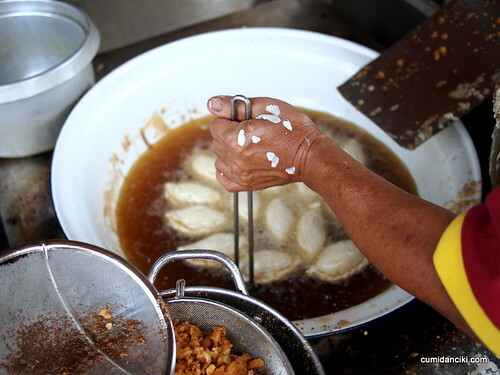 The square kuih bakul is laid out and dunked in boiling oil, completely submerged and fried until it is crispy brown. When you eat this kuih you will find the molten nin ko still warm and gooey in the centre of the crispy outer yam/potato shell. It’s like a sugary, aromatic explosion of gooey delight as you bite into the savoury cake. The same goes for the goreng pisang (banana fritter) and the curry puff. The trick is in the heat of the oil – it should be hot as a furnace, and also the amount of time spent frying the snacks. Mr Chiam’s stall has it down to a fine art. I’ll let the photos speak for themselves. Boiling hot oil and out comes the crispy, golden banana fritter! 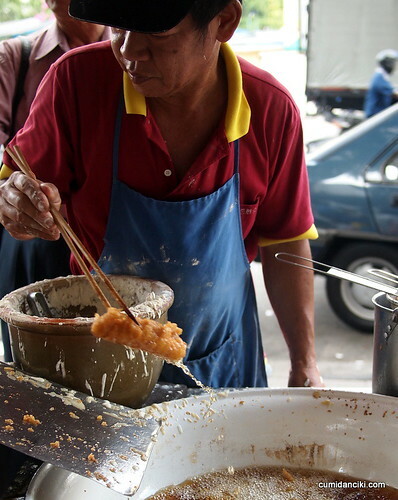 Fast disappearing kuih bakul and banana fritters..
We love Mr Chiam’s goreng Pisang, and so does @ladyironchef now! 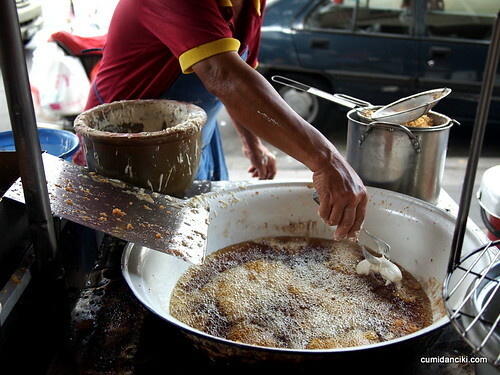 ohh yummy fritters, make me miss the office at KL Sentral! oh yeah baybeh.. come home! 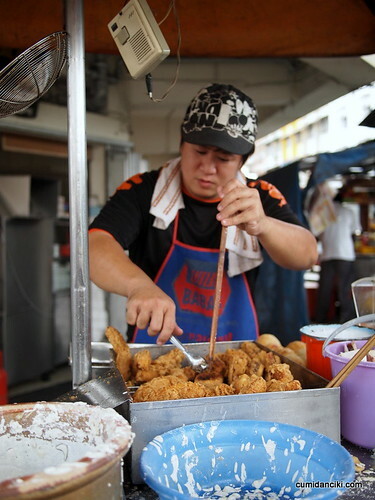 Thanks for bringing Brad to Mr. Chiam’s goreng pisang stall! He brought some back for Devil & me… So yummy! i know! we overate as usual kenny! not really. still congested. part of the charm LOL! 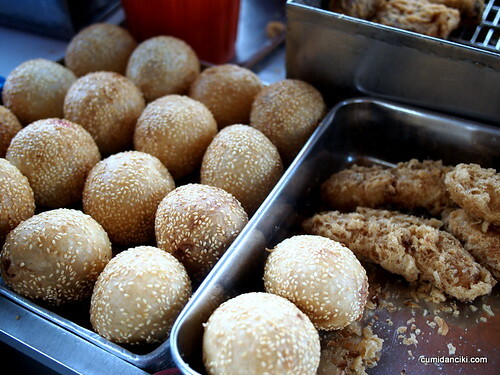 Seriously need to go Brickfields jor! The abundance of good Indian food, and these fritters for tea time! you are here now, call me la, we go!